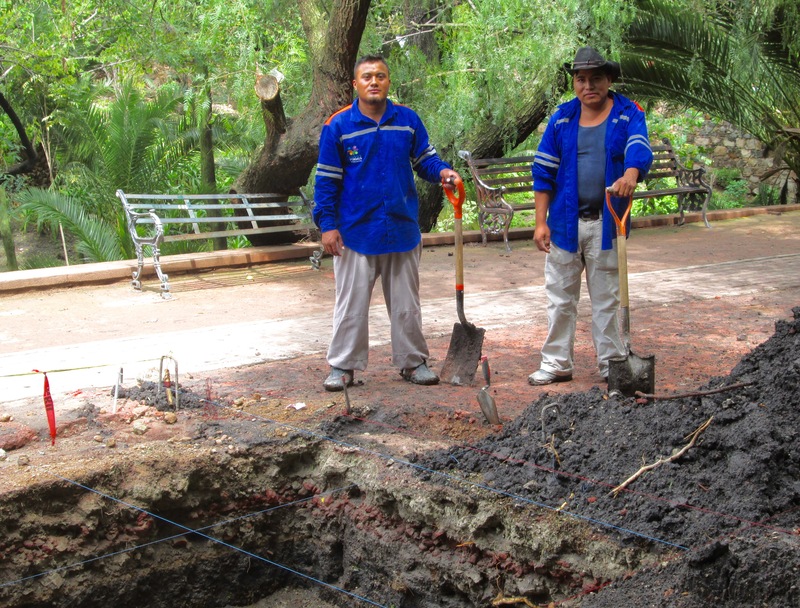 Strong men have been hard at work lately digging a deep pit – about seven feet square and four or five feet deep – in the heart of the green and lush Parque Juarez here in San Miguel de Allende, Mexico, as though digging for buried treasure. For days recently on my walks in the park I’ve observed the men’s strenuous efforts and wondered what they were actually up to. I made a note to self as I went on my way: BE THERE. 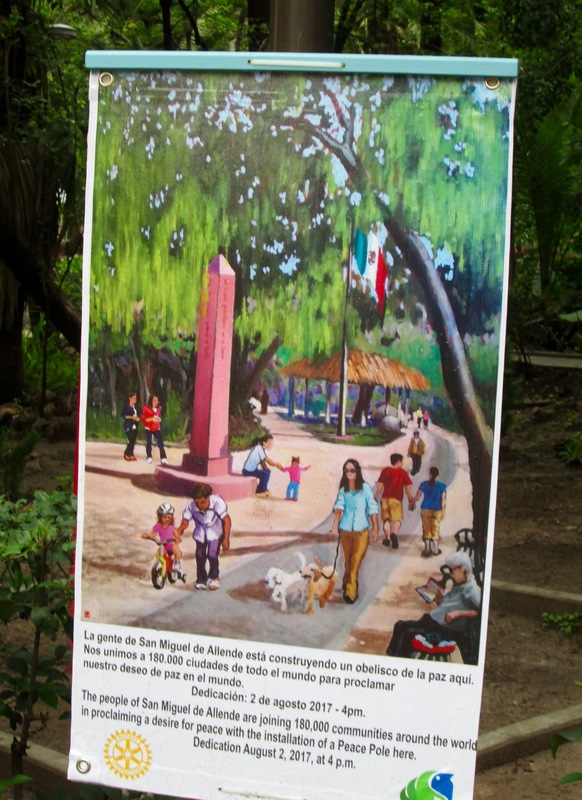 The current issue of San Miguel’s weekly bilingual newspaper, Atención, has told me more about this (literally) groundbreaking project: The three-meter-tall, four-sided, pink quarry stone Peace Pole in Parque Juarez will display the prayer “May Peace Prevail on Earth” in English, Spanish, Otomí, Nahuatl, Braille, and Mexican Sign Language. It will also have a Rotary Club message of peace through service in both English and Spanish. This particular project is the result of efforts by a number of individuals and local nonprofits, including the Rotary Club. “No government or political party funds have been accepted,” the Atención article stresses. But I wanted to know even more: Who originated this worldwide project? How long has it been going on? Where are other Peace Poles located? How might WOW readers in other parts of the world initiate their own Peace Pole installations if they’re so inspired? There are tens of thousands of Peace Poles – at schools, churches, synagogues, mosques and temples across the United States and in more than 180 other countries — all over the world dedicated as monuments to peace. “They serve as constant reminders for us to visualize and pray for world peace,” the Peace Pole Project website says. The first Peace Pole was placed at the Hiroshima Peace Memorial in 1955, ten years after the U.S. dropped an atomic bomb on Hiroshima. The visionary behind the five-word “World Peace Prayer” (May Peace Prevail on Earth) was the Japanese philosopher and spiritual leader Masahisa Goi. According to the website www.readthespirit.com, as a child Goi was very frail, so to deal with his poor health he began to explore the disciplines of yoga, spiritual healing and the martial arts. World War II was a traumatic spiritual experience for him, and he began to yearn desperately for peace, not only for Japan but also for the world. Through books and lectures he encouraged people to seek inner peace as well as world peace. In a long journey of prayer in which he asked to be of service to humanity, Goi believed the prayer “May Peace Prevail On Earth” was given to him. He believed that if people put their efforts into this prayer for peace it would have a uniting effect for all humanity. Peace Poles were designed to be inscribed with this prayer in various languages. These poles would then be set into the ground as constant reminders and witnesses to the hope for peace. Many religious leaders have planted Peace Poles, I learned, including Pope John Paul II, Mother Teresa, and the Dalai Lama. Masahisa Goi’s simple prayer has become an inspiration to millions of people around the world who have never heard his name but have shared his passion and hope. 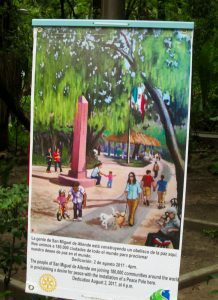 When I attend the dedication of San Miguel’s own Peace Pole on August 2, I’ll have a deeper appreciation for the power of one frail person possessing a positive, inspired idea to make the world a better place. 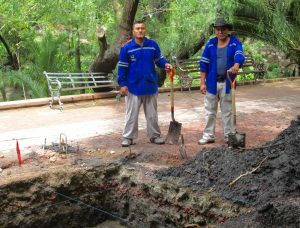 I’ll also know the hard work that went into planting this Peace Pole because I saw the sweat on the men who hand-dug the pit for it. The main takeaway for me will be: Peace is a treasure, and it doesn’t come easy. It requires equal parts determination, organization, inspiration, hope, and – oh, too — backbone. For more information on how you might plant a Peace Pole in your community, go to: www.peacepoleproject.org.